American painter George Benjamin Luks was a pioneer realist, a member of "The Eight," and a vigorous opponent of academic and conservative standards in subject matter. George Luks was born in Williamsport, Pa., on Aug. 13, 1867. About 1884 he entered the Pennsylvania Academy of Fine Arts but soon made his way to Europe, where he remained for several years. His chronology and many details of his life remain obscure because of the extravagant claims he made about exploits which seem to have been wholly fictitious. At Dusseldorf he acquired a taste for somber colors. He may have worked in London and Paris as well. He admired Rembrandt and Frans Hals. On his return to Philadelphia in the early 1890s, Luks supported himself precariously by all kinds of commercial jobs—by painting signs, circus and band wagons, campaign portraits, and houses and floors. Frequent references to activities as a professional prizefighter (under a variety of picturesque names) do not seem to be founded on fact. Like Glackens, Sloan, and Shinn, he was employed as a newspaper artist, and he was sent by the Bulletin to cover the Spanish-American War in 1895. His illustrations were lively and exciting but apparently largely imaginary, as was the story that he had been captured, sentenced to death, and deported. He returned, penniless, to New York, where he was employed by the World. He was one of the earliest comic strip artists and continued R. F. Outcault's "The Yellow Kid," created in 1895, when Outcault moved to another paper. For 15 years most of his work was in black and white; it was only in 1898 that Luks started painting. He was married three times. Luks was fascinated with the characters and environment of the Lower East Side and consciously attempted to portray these with the explicitness and vitality of Hals. Beggars, drunks, actors, street urchins, prizefighters, the whole range of urban activity, are presented with sharp observation and gusto. Street scenes and landscapes are rarer subjects. The rejection of one of Luks's paintings from the 1907 exhibition of the National Academy of Design was one of the causes for the formation and exhibition of "The Eight" in 1908. Luks's work in this show had a kind of raw strength and even brutality which offended academic patrons and critics but brought him into attention. From this time on his work was increasingly exhibited, received a number of prizes, and was acquired by the more daring contemporary collectors. For a time, he taught at the Art Students League. Luks was a radical only in subject matter, not in style or technique. He was involved in the formation of the 1913 Armory Show, in which he was well represented. However, he was unable to understand or accept the genuinely radical European art, which was shown in America for the first time, and resigned from the society which had formed the show. Luks, always lusty and belligerent, was apparently killed as the result of a tavern fight on Oct. 29, 1933, dying in New York on the streets which he had immortalized on many canvasses. 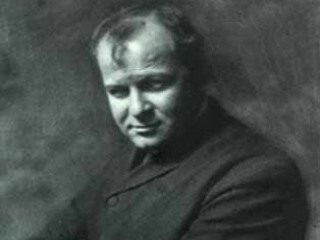 View the full website biography of George Luks.